62 · Floor Worker · Burt L. Standish · nv; wrestling. 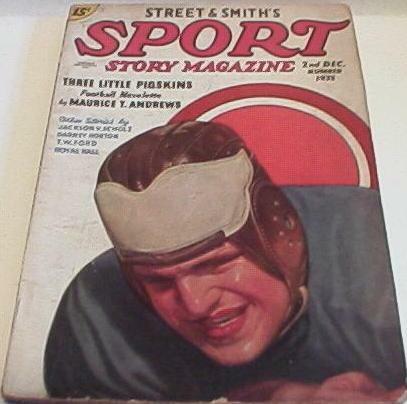 9 · Three Little Pigskins · Maurice T. Andrews · nv; football. 33 · The Forgotten Leg Man · T. W. Ford · ss; cross country. 45 · Feud · Franklin P. Miller · ss; football. 67 · Different Angles · Jackson V. Scholz · ss; handball. 77 · The Speed Doctor · Dabney Horton · nv; marathon race. 96 · Chip Off the Old Block · Paul V. Millard · ss; football. 105 · He Managed Himself · Royal Hall · ss; boxing. 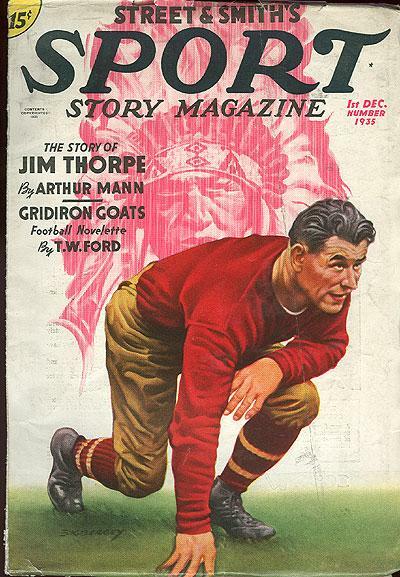 116 · The Touchdown Apollo [Part 3 of 4] · Robert N. Bryan · sl; football. 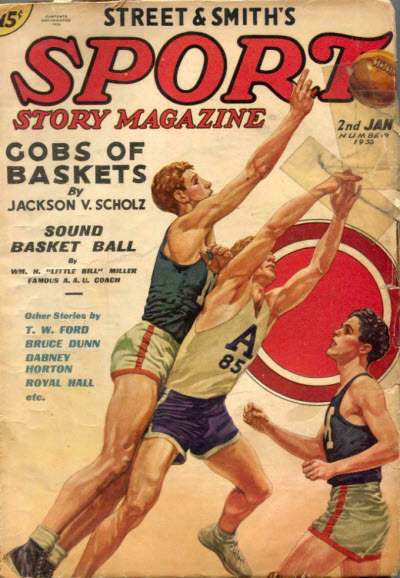 7 · Gobs of Baskets · Jackson V. Scholz · nv; basketball. 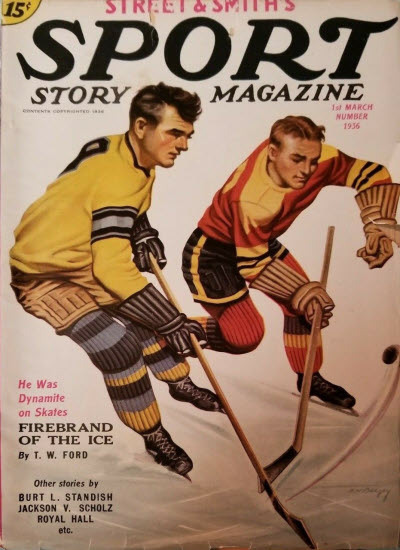 28 · The Vicious Violet · T. W. Ford · ss; hockey. 40 · Tough on Tenors · Leonard Lupton · ss; wrestling. 62 · Slaves of the Pigskin · Dabney Horton · nv; football. 81 · Sock Shy · Eric Robert · ss; boxing. 92 · Exhibition Haul [Matty Mathews] · Bruce Dunn · ss; baseball. 103 · Backfield Harmony · Royal Hall · ss; football. 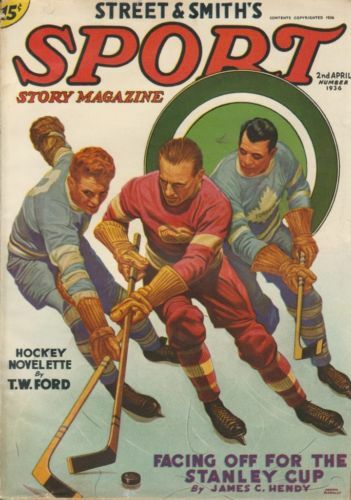 113 · The Dynamite Flynns [Part 2 of 4] · Leslie McFarlane · sl; hockey. 12 · TNT Twins · T. W. Ford · nv; indoor track. 34 · Ring Feud · Burt L. Standish · ss; boxing. 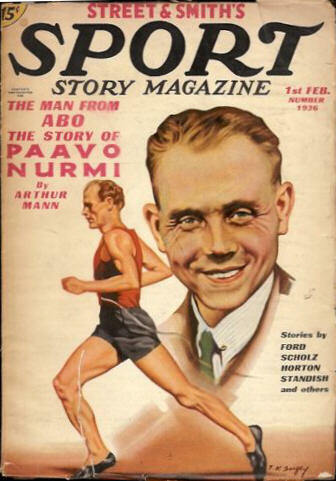 45 · The Man from Abo [Part 1 of 3] [Paavo Nurmi] · Arthur Mann · bg; the life story of Paavo Nurmi. 55 · Puck Plugger · Eric Rober · ss; hockey. 66 · One Coach Is Plenty [The Three Musketeers] · Jackson V. Scholz · nv; basketball. 84 · The Battle Flag · Dabney Horton · ss; football. 95 · Doctor Tahquitz · Robert N. Bryan · ss; golf. 106 · Crimson Skis · Warren Elliot Carleton · ss; ski jump. 117 · The Dynamite Flynns [Part 3 of 4] · Leslie McFarlane · sl; hockey. 8 · The Oak Street Basketeers [Part 1 of 4] · Robert N. Bryan · sl; basketball. 25 · The $1,000 Touchdown · Eric Rober · ss; football. 36 · Bungled Batons · Jackson V. Scholz · nv; indoor track. 56 · Staghorn Run · Leonard Lupton · ss; bobsled race. 68 · The Man from Abo [Part 2 of 3] [Paavo Nurmi] · Arthur Mann · bg; Paavo Nurmi clears the tracks. 79 · Rink Traitor · T. W. Ford · nv; hockey. 99 · Us & Company · Royal Hall · ss; boxing. 110 · Blurred Baskets · Jack Volney · ss; basketball. 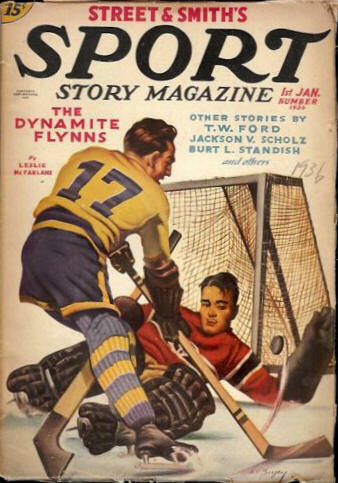 120 · The Dynamite Flynns [Part 4 of 4] · Leslie McFarlane · sl; hockey. 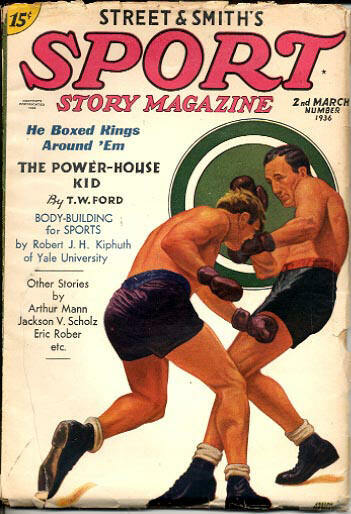 12 · The Power-house Kid · T. W. Ford · nv; boxing. 33 · Court Cut-up · Royal Hall · ss; basketball. 43 · One-way Skater · Arthur Mann · ss; hockey. 64 · Muddled Miles · Jackson V. Scholz · nv; indoor track. 83 · Game Guy · Burt L. Standish · ss; indoor tennis. 95 · Hot Ice · Eric Rober · ss; hockey. 106 · A Waltz at First Base · Bruce Dunn · ss; baseball. 116 · The Oak Street Basketeers [Part 3 of 4] · Robert N. Bryan · sl; basketball. 10 · Chain-Store Player [Part 1 of 4] · Arthur Mann · sl; baseball. 27 · Gun Shy · Jackson V. Scholz · ss; indoor track. 37 · Roughnecks Game · Franklin P. Miller · ss; lacrosse. 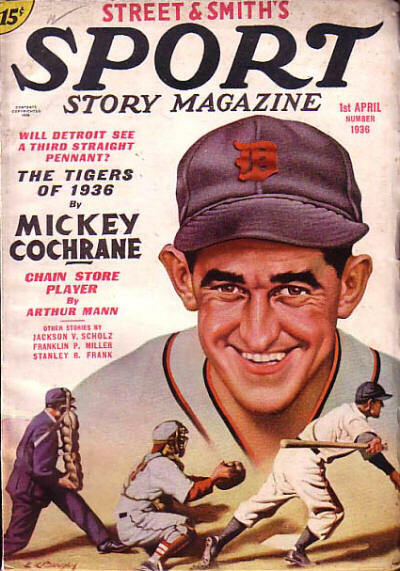 49 · The Tigers of 1936 · Mickey Cochrane · ar; will they win their third straight pennant?. 57 · Sucker Play · Stanley B. Frank · nv; basketball. 78 · Neutral Corner · Royal Hall · ss; boxing. 88 · The Softy at Center Ice · Leslie McFarlane · nv; hockey. 107 · The Hot-Headed Catcher [Matty Mathews] · Bruce Dunn · ss; baseball. 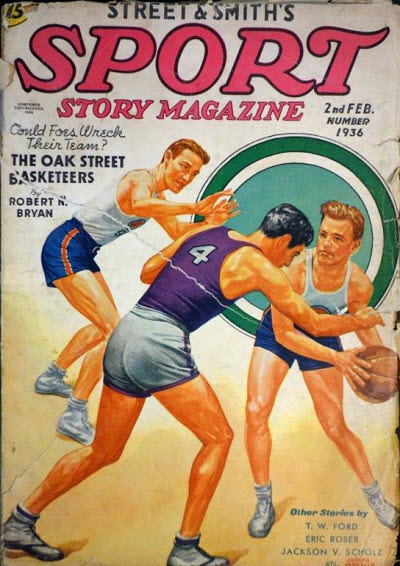 118 · The Oak Street Basketeers [Part 4 of 4] · Robert N. Bryan · sl; basketball. 6 · Counter Fighter [Part 1 of 4] · Burt L. Standish · sl; boxing. 23 · Heres How! 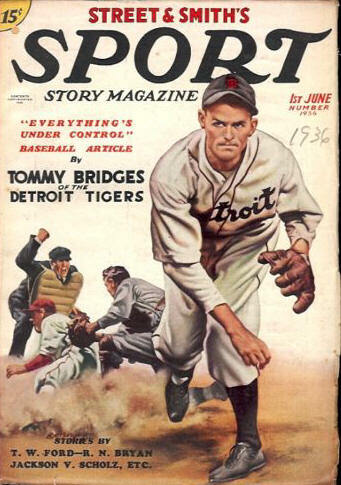 · Charley Gehringer · ar; the Tigers second baseman explains his principles. 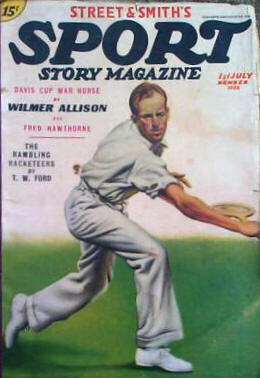 31 · Hero Maker · T. W. Ford · ss; tennis. 42 · The Battling Backstop · Robert N. Bryan · nv; baseball. 64 · Shanghaied Stroke · Jack Volney · ss; crew. 75 · Shooting Match · Leonard Lupton · nv; wrestling. 93 · Hurdle Wrecker · Royal Hall · ss; hurdle race. 103 · Golden Apples · Jackson V. Scholz · ss; track. 112 · In the Bag · Philip F. Deere · ss; boxing. 115 · Chain-Store Player [Part 4 of 4] · Arthur Mann · sl; baseball. 104 · The Gas-house Terror · Paschal N. Strong · ss; lacrosse. 94 · Check Dodger · Paschal N. Strong · ss; lacrosse. 105 · Lone Wolf · A. Clifford Farrell · ss; auto racing. 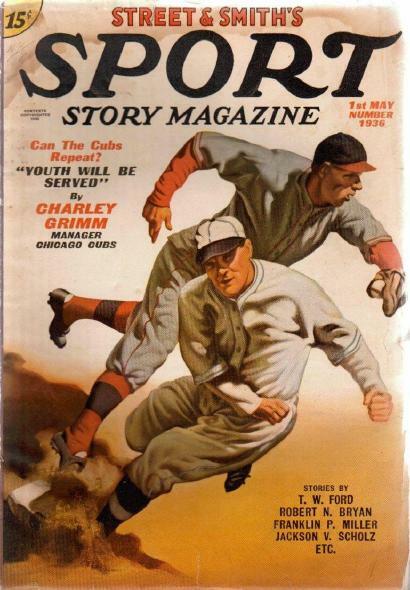 8 · Three-And-Two Pitcher · Arthur Mann · nv; baseball. 30 · Dash Duffers · Jackson V. Scholz · ss; track. 41 · Polo at Circle H · Royal Hall · ss; polo. 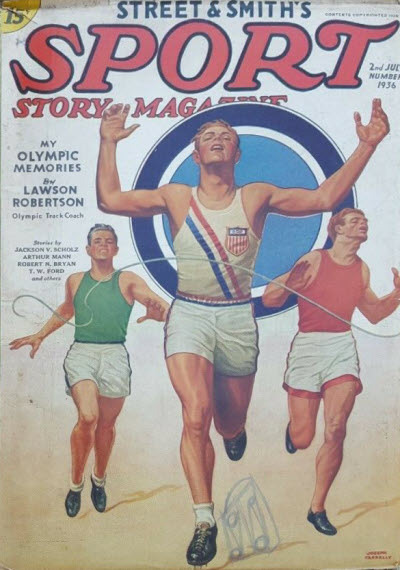 54 · My Olympic Memories [Part 2 of 3] · Lawson Robertson · bg; the famous Olympic track-team coach continues his series of sidelights on past Olympic Games. 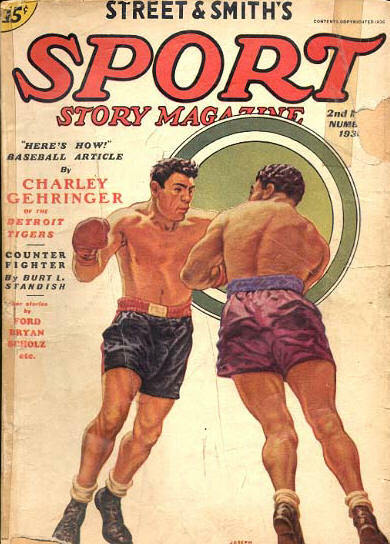 64 · Tiger Man · Robert N. Bryan · nv; boxing. 84 · Choppy Water · Warren Elliot Carleton · ss; swimming. 94 · Too Hot to Handle · L. H. Gregory · ss; baseball. 105 · Baldwin Eats a Pie · Leslie McFarlane · ss; boxing. 114 · The Rambling Racketeers [Part 3 of 4] · T. W. Ford · sl; tennis.